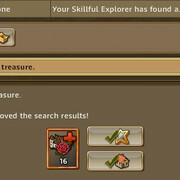 But now gives 50% more normal ressources on the prolonged treasure search and only 1 slot of flowers instead of 2 (is this intended?). All other searches working normal now. Thank you for the report. This issue should be fixed before live deployment.